"Do not expect to return home alive." If anyone in Hollywood has earned the right to rest on their laurels, it's Clint Eastwood�as an A-list movie star and later as a very fine filmmaker, Eastwood long ago completed the arc from young Turk to grand old man, and the ratification of his status came fifteen years ago already, with all the praise and awards heaped on Unforgiven. But rather than coast on reputation alone or simply phone it in, Eastwood's work has gotten more assured and skilled�the recent run of Mystic River, Million Dollar Baby, Flags of Our Fathers and now Letters from Iwo Jima is a late-career run practically unprecedented. It may be overstating the case, but you almost have to look to other disciplines for appropriate analogies�Eugene O'Neill's best work came after he won his Nobel Prize, and Willem de Kooning stripped away much of the ornamentation in his later years, producing a style that's spare and filled with the knowledge of a lifetime of accomplishment. Admittedly that's some mighty august company for anyone to be in, let alone someone as laconic and self-effacing in his public appearances as Eastwood. And over the shorter term, one obvious way to appreciate this film is as a companion piece to Flags of Our Fathers, and a further investigation into the horrors of war and the nature of heroism�it's like Eastwood wants to give a dimensionality to the ancestor worship of The Greatest Generation, by acknowledging the bravery of the men who fought World War II without deifying them. In some respects it's a straight-up diptych, with Flags telling the story of the battle of Iwo Jima from the American point of view, and this film from the Japanese one; but even on its own, this is a deeply compelling film, one that's beautifully made though unflinching in its look at the business of warfare, and in some ways a deeply courageous act of cross-cultural art. The movie is entirely in Japanese, and in less assured hands, the approach might seem patronizing or banal�but Eastwood (who has acknowledged the debt he owes to Kurosawa) handles it deftly and sensitively. The Japanese stationed on Iwo Jima seem on some unacknowledgeable level resigned to their defeat�it is 1944, the Allies are conquering the Pacific, and an invasion of the Japanese homeland seems inevitable. If the Emperor's Army can fight off the Americans at Iwo Jima, however, perhaps they can stanch the bleeding. Ken Watanabe stars as General Tadamichi Kuribayashi, the new Japanese commander on the island�he has spent some time in the U.S. and hence knows the enemy well; he knows his countrymen even better, and can see how willfully deluded many of the men under his command remain about Japan's prospects for victory. What he finds is a unit in near pandemonium, without a coordinating plan, with petty bullies allowed to act out vengefully against men of lesser rank. Eastwood flops the conventional American war movie�here it's the Japanese who are humanized, the Americans who are the nameless, faceless, relentless enemy, and it's on some level an essay on the Japanese character�Kuribayashi believes that even in retreat, a live Japanese soldier is better than a dead one, but his seems to be a minority opinion. As you might surmise from the title, we get a little bit of backstory on the central characters as they write home, allowing us to learn more about them and to escape the claustrophobia of war; Eastwood never pushes this too hard, though, and the film is fraught with tension, even though we know how things are going to end up. And it's a film of great technical accomplishment as well�Eastwood's de facto stock company behind the lens is kind of the last bastion of the studio system, and you can see the fruits of the collaborations over the years. The stock has been drained of almost all color, and the palette concentrates on the blues and grays�the brutal, saturated oranges and reds of fire and blood, the palette of battle, becomes that much more shocking and arresting. You can't help but reflect, too, on Eastwood's industry savvy�it seems pretty clear that the release of this film was accelerated because the grosses of Flags were disappointing, and Clint sure does like those aisle seats down front on Oscar night. (You can't blame him.) It's a sinuously made, efficiently told and deeply felt story of war, and Eastwood and company deserve all the praise that has come their way. Image Transfer Review: The carefully employed color scheme is reasonably well transferred here, though things occasionally look a little smudgy and lacking in sharpness. Audio Transfer Review: A sharp and nuanced audio transfer, that's heavy on the echo; but for a brief appearance by an American P.O.W., all of the film is in Japanese. 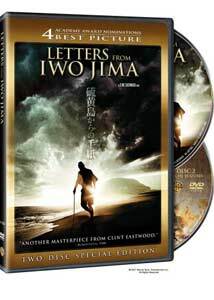 Extras Review: Aside from some trailers, all the extras are on the second disc of this set, starting with Red Sun, Black Sand: The Making of Letters from Iwo Jima (20m:58s), which features interview footage with Eastwood, producer Robert Lorenz, screenwriters Paul Haggis and Iris Yamashita, and production designer James Murukami, among others. They discuss this project growing out of Flags, and go over the evolution of the project. The Faces of Combat: The Cast of Letters from Iwo Jima (18m:35s) actually focuses more on the casting directors than the actors themselves, with the bilingual challenge being in the forefront. Images from the Front Lines: The Photography of Letters from Iwo Jima (03m:24s) is simply a montage of stills, and two pieces from the film's world premiere in Tokyo round out the package. First it's opening night (16m:06s), with Eastwood walking the red carpet with his interpreter, and an appearance on stage by members of the cast and the production team; and later at a press conference (24m:26s), the audacity of Eastwood's undertaking is the principal topic of conversation. As humanizing a document as John Hersey's Hiroshima, and as carefully crafted as any of the films in Clint Eastwood's recent flourish.